Dieter (ディター Ditā) is a member of the Scouting Legion. 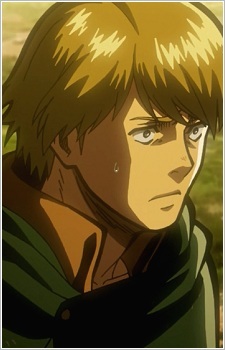 In Episode 22, Dieter argues with Erwin and Levi to return to retrieve the bodies of dead scouts. Erwin however decides to abandon all bodies they were unable to retrieve and return to the walls immediately. Dieter acts against this command and retrieves the body of his friend Ivan and in effect lures titans to the scounting legion. This choice ultimately causes further casualties and forces the scouting legion to dump bodies weighing down the carts. After this incident, Levi confronts Dieter and hands him Petra's Scouting Legion Badge saying that it was Ivan's. He says that this was proof that Ivan must have been alive, causing Dieter to break down into tears. He is last seen on one of the carts returning to Wall Rose, holding the badge in his left hand.